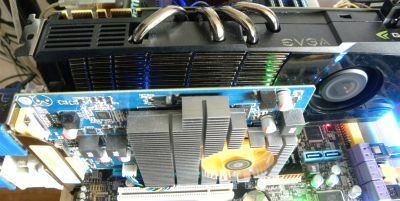 Galaxy has presented a prototype of a dual-GPU card with a GTX 470 for 3D and a GT 240 for PhysX. A GPU dedicated for PhysX is a good idea but the GT 240 GPU is it an interesting PhysX-GPU? Actually, my current system has an EVGA GTX 480 and a Zotac GT 240. 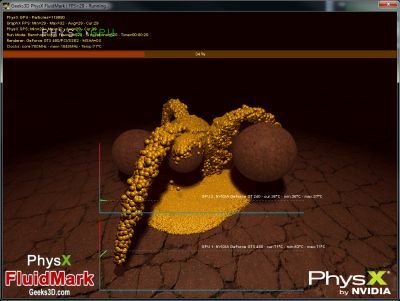 So let’s test it with PhysX FluidMark 1.2.0 to see the impact of a GT 240. I did two kind of tests. The first one has the support of Multi-core PhysX disabled. That means the PhysX is processed in the same thread than the graphics rendering. The second test has the multi-core support enabled. That means the PhysX is processed in one separate thread (PhysX GPU) or in multiple separate threads (PhysX CPU). For each kind of test, the PhysX is processed by the GTX 480, then by the GT 240 and by the CPU. I set the number of particles to 120’000 (120K) in order to have a quite heavy PhysX load. – FluidMark settings: 1024×768 windowed, no AA, 3 emitters. As we can see, the GT 240 is able to process PhysX correctly, especially compared to the CPU. Now, depending on the heaviness of the main scene for the rendering, the GT 240 can help or not the main GPU. With this version of FluidMark, the GT 240 is not really useful because the main scene is not very heavy and the GTX 480 is a powerful GPU. I’ll try to update FluidMark with an option for enabling a heavy scene and I’m sure we’ll see the real impact of the GT 240. 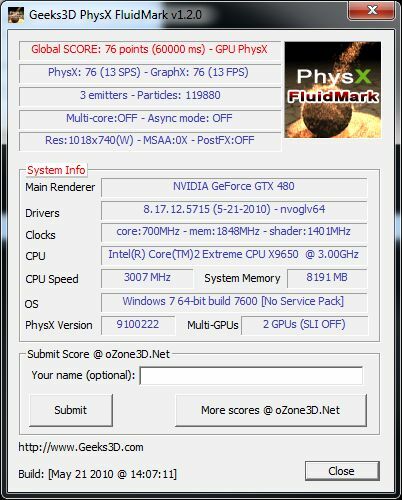 Async mode allows to unlock rendering… Did you notice the rendering score when the GTX 480 is not used for PhysX? can you explain the difference between Multi-core PhysX enabled or disabled ? “Multi-core PhysX disabled. That means the PhysX is processed in the same thread than the graphics rendering” isn’t really comprehensible. Thanks for the test, but i need an explanation about 2 GPUs one for 3D and the other for Physx. well, i have : Asus Crosshair II Formula (AM2+)(780a) / AMD Athlon 64 X2 5200+ / 2Gb DDR800 / WinFast GTX 260 EXTREME and Gigabyte 9600 GT fanless / 550 Watt atx power supply. So, right now im using just one card the 260gtx. If i want to use the second card (9600gt) for physX what should i do ? @Gmasterschief…all you need to do in install the 2nd card, install 257.15 driver, and select the 2nd card to do the physx in the nvidia control panel, quite simple. @JeGX..any chance of a multi-core “Async” run. @WacKEDmaN: I do it right now. Thank you WacKEDmaN, everything is ok 🙂 , and as you said it was quite simple 😉 . nice!..my 470 is running almost as good as the 480…but my 9400GT needs an upgrade!.. CPU Q8200 – 4GB RAM – 8x PCI-E bus..
how about(amd phenom ii x6 1099t) octa core enable for physic?